5 Bonus – Gym Fails Video! 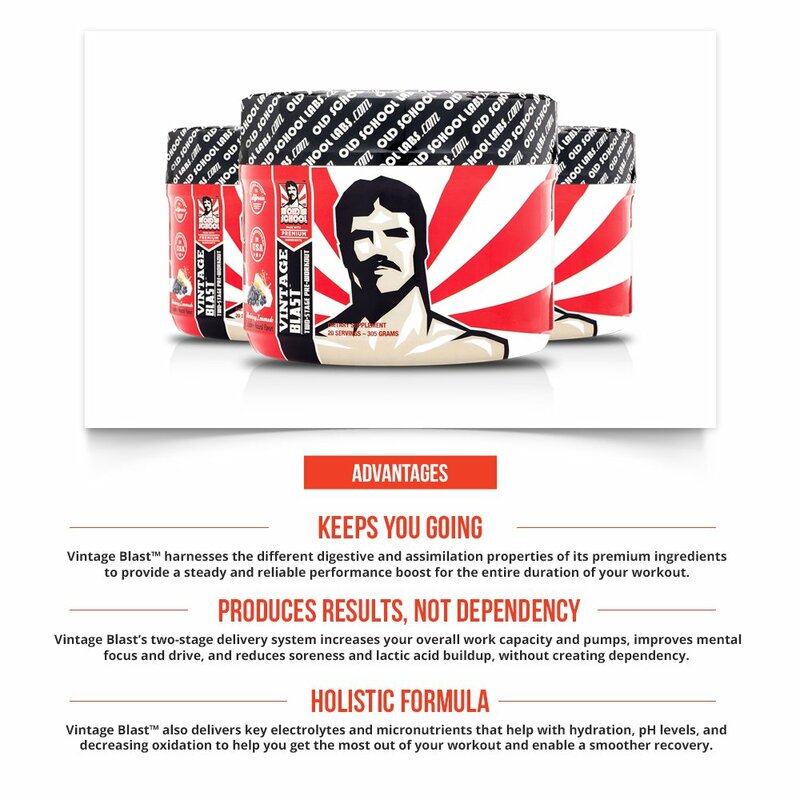 I find it somewhat amusing that the Vintage Blast pre workout supplement released by Old School Labs is actually one of the new school products that differentiate themselves from the pack by adding a new twist to a proven selection of ingredients. I mean really, when it comes to pre workout supplements the basic formula is much the same – Beta Alanine, N.O. booster, amino acids and stimulant/nootropic, so the only way to really stand out from the pack is to improve the way these substances are delivered to the body. 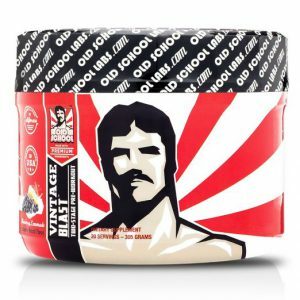 In this post I will talk a little more about what this means, look a bit deeper into the formulation of Vintage blast and also look at what makes this product different, what they mean when they say that it is a 2 stage pre workout and how this is done. 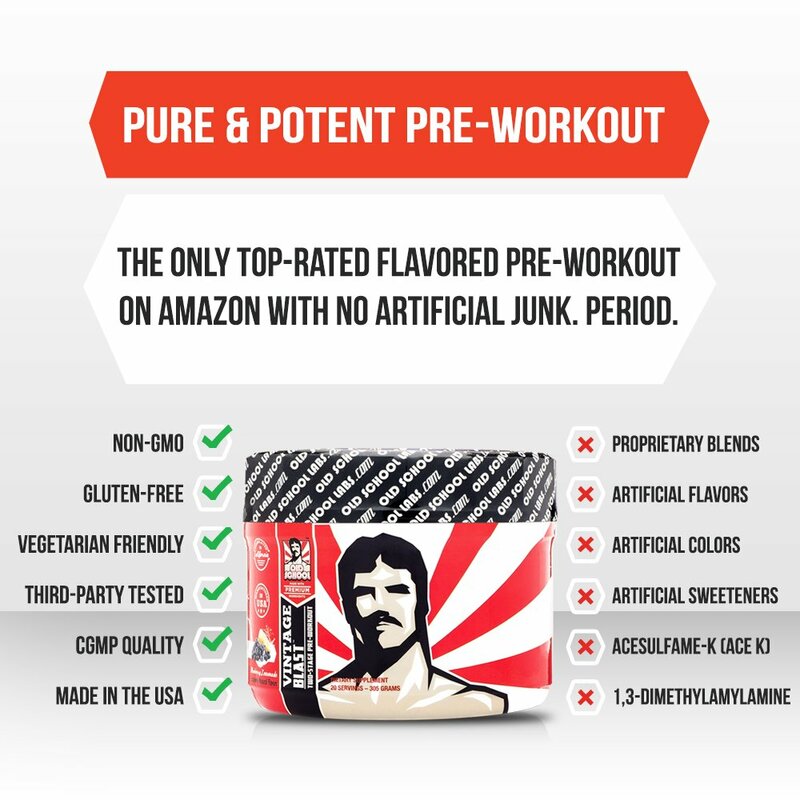 As stated above, most pre workout supplements you will find on the shelves in a supplement store today are very similar. They will usually contain some form of Beta Alanine for muscular endurance, some form of N.O. booster for blood flow, caffeine for energy and fat burning, and some other stimulant and/or nootropic ingredients for motivation and mental focus. There is a good reason that most products follow this recipe and that is because exercise and nutrition science has shown that this is what works. The quality of the ingredients can vary across different manufactures and products but for the most part they are all fairly similar, and achieve similar results. So how does one add value to a formula that is already fit for purpose? Well while the ingredients that go into pre workout supplements have almost plateaued, the mechanisms for getting this stuff into our bodies are still in their infancy. The status quo is a powder that is mixed in water and then you drink it. There are several flaws with this system that personally I am surprised haven’t been improved upon earlier. As most of us know all too well, the degree to which different products dissolve is variable. Some are great but others are hard to mix and leave grainy bits at the bottom. Also, the way that they keep over time. Some of the ingredients absorb moisture from the air and have a tendency to clump over time. Most products suffer from this, some more than others and even some batches of the same product. I have received different containers of the same product, one dry and powdery and when I opened the other package it was just one thick clump. This can be somewhat controlled with desiccant packets but it is still an issue. Furthermore, I think the biggest issue is that usually you drink your pre workout and the energy profile is like ‘boom to the face!’ and then fades away while you’re still working out. I personally would prefer the energy hit to increase while I’m working out because it is towards the end of my workout when I am getting tired which is when I really need it. 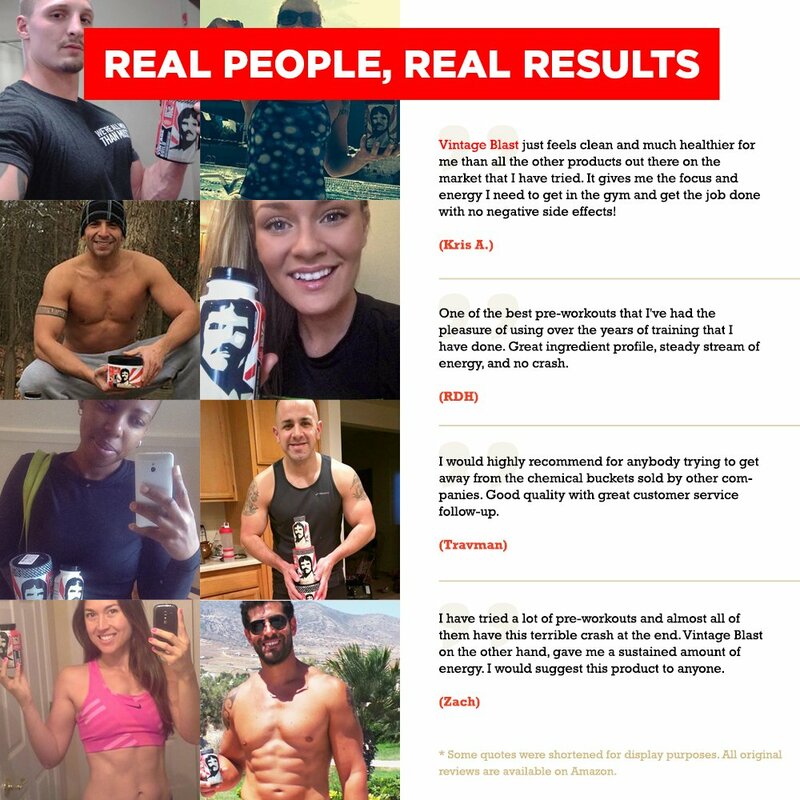 This is where I see the biggest opportunity for improvement to pre workout supplements – if they could deliver this energy more smoothly over a longer period. Old School Labs has come up with a solution to this problem with their 2 stage Vintage Blast pre workout. Old School Labs touts that this product “is specifically designed to harness the different digestive and assimilation properties of its ingredients”. What does this mean exactly? Good question! Lets have a closer look at the formulation and try to work it out. I will break the Ingredients in Vintage Blast up into their categories- stage 1 group, stage 2 group and ‘the rest’. At a glance the formula looks good, however I will look at each component in detail as we progress through the review. Just like the name of the ‘group’ this formula starts strong with a hefty 5g of L-Citrulline Malate. This amino acid is known to help delay the onset of muscle fatigue, basically allowing you to do more repetitions at a higher intensity. It has also been shown to have N.O. boosting properties as well. 5 grams is a good dosage. The next ingredient is a measly 1 gram of Beta Alanine, which is not really going to do much at all. Clinically effective doses of Beta Alanine in various studies range from 4-8grams. Beta alanine is found in many foods but I would expect to see at least 3 grams included in a pre workout to have any major benefit. Beta Alanine achieves very similar results to L-Citrulline Malate though so in my opinion it is not really needed at all and is probably more of a token inclusion here, becasue 1 gram of it is almost pointless. Next we have 1 gram of L-Arginine to help get your pump on. For a real vein busting pump I would like to see a bit more but L-Arginine is said to work synergistically with L-Citrulline Malate so 1 gram is probably sufficient. The next ingredient is a less common, though very effective ingredient. L-Carnitine is included here which will help your body burn more fat and while it is not technically a thermogenic it produces very similar effects. The stage 1 group is rounded off nicely with 150mg of caffeine which is enough to get you going without making you jittery or anxious. The inclusion of D-Aspartic Acid (DAA) is an interesting aspect of Vintage Blast. DAA is commonly used as a testosterone booster and I don’t see any immediate benefit (ie during your workout) to taking it here. If taken regularly though it can certainly help to increase strength and muscle growth so it is a nice inclusion. N-Acetyl L-Tyrosine is a nootropic substance that is said to help reduce stress thus improving mood and boosting attention and focus. It also helps you concentrate for longer before becoming mentally fatigued so it’s good to help you maintain motivation and focus through a long workout. The micro-encapsulated caffeine is absorbed more slowly which means you get a secondary caffeine boost, though it is more like your initial boost is sustained for longer rather than the usual peak and crash effects of just Caffeine Anhydrous. Also included here is Synephrine which you may have heard of as Bitter Orange. This is included in many products and is said to be a powerful fat burner. The rest of the ingredients in Vintage Blast are fairly standard. It contains a nice vitamin B complex and worthy of special mention are the magnesium and zinc which assist the body to utilize more of the active ingredients discussed above. I’ve only tried the Blueberry Lemonade flavor which I found delicious. Amino acids usually have a quite bitter taste and there are quite a few in this formula so I was pleasantly surprised the they covered this up well without using any artificial flavors or sweeteners. Overall I would say this is a a good product that would suit most people looking for a generally effective pre workout product to enhance their resistance training. Extra credits for the micronised caffeine, DAA and L-Carnitine. If I had to pick a highlight it is definitely the micro encapsulated caffeine which translates to longer lasting energy and a less pronounced crash. This review is just my opinion of course, you can read other people’s reviews on Amazon here too. Bonus – Gym Fails Video! 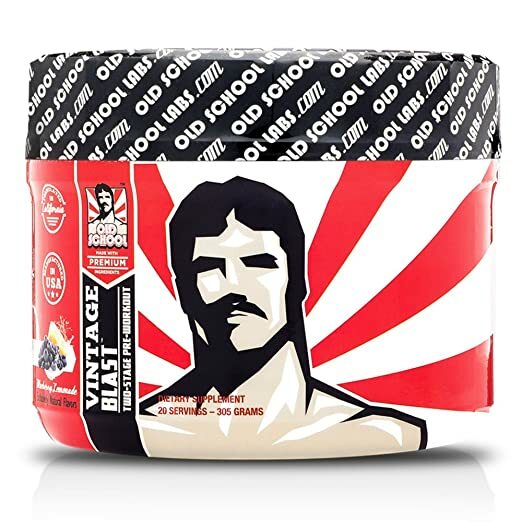 Vintage Blast look like a very effective pre workout supplement. I am familiar with the grainy residue left by drink mixes. I will check the ingredients of what I am using as compared to Vintage Blast. Are all your supplements produced by Old School labs? Are these products NCAA approved or free from banned substances? Hi Marty, I don’t condone the use of any products containing banned or dangerous substances and therefore do not review them. Have a good day! A well-written post that makes me want to buy the product, however, I am a little skeptical. This is not because of your review but my own self-doubts of whether pre-workout supplements will make me gain weight. I know it sounds crazy but it’s a paranoid thought I have. Is there a way that you can help me clear my mind of this ridiculous notion? Thanks Amberlee, some people worry that the creatine in some pre workouts will cause you to gain weight but I wouldn’t worry as this is only water weight and the amount of creatine in most pre workouts is not enough to really do too much anyway. Personally, I haven’t used vintage blast…..yet. But on the lookout for products which won’t give me the tingling sensations as many pre workouts do. Really aren’t a fan of beta-alanine. But you have written a great review on this product and I’m willing to give it a go! When would be the best time to take this product, as usually train in the late afternoon. Would this have an impact on my sleep? P.S. 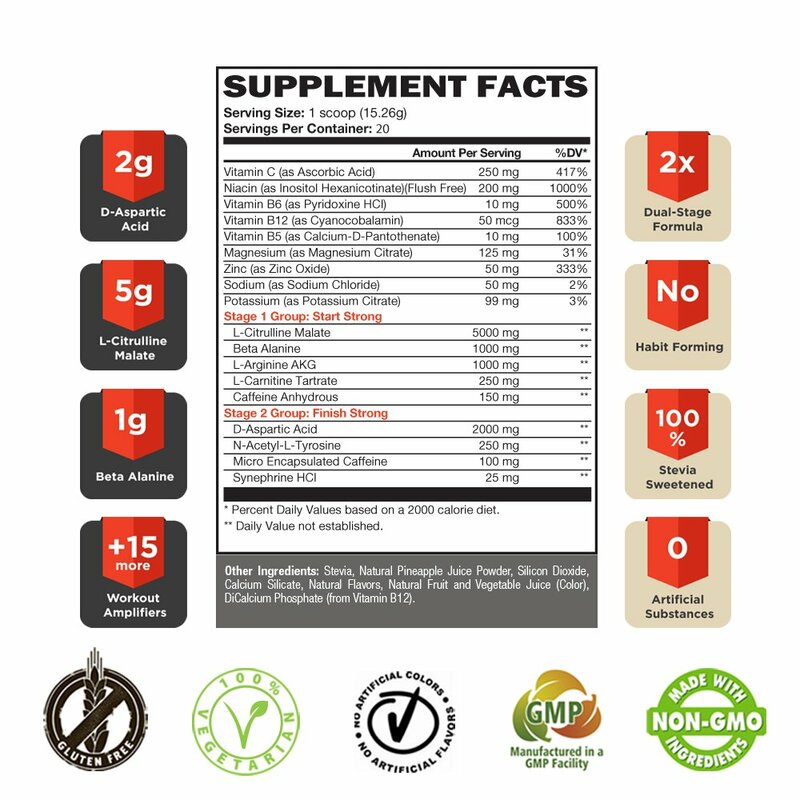 Can i stack vintage blast with a product like L-Carnitine? If you take this in the afternoon I wouldn’t imagine you will have any trouble sleeping but it depends how sensitive you are to caffeine and what time you go to bed. Try half a serve first and see how you go. As for stacking it with L-Carnitine – this product includes 250 mg of L-Carnitine so you shouldn’t need to take any additional. We’re so pleased that you enjoy our products! Please let us know if you ever have any questions and how we can best help you fulfill your goals or goals of your readers! Thank you Old School Labs!